Summer has officially arrived and it's finally starting to feel like it too. So when the sun rays peeks through, make sure you enjoy its presence safely and in moderation by protecting your skin. Here are 2 facial sunscreens that will not only keep your skin moisturised but give you the protection you need to safely venture outdoors. This will not only protect you from the sun, but it will give you a big-antiaging boost with its list of 56 super-charged anti-aging ingredients like vitamin A, C, E and cell protecting amino-acids. Only SPF 20 I hear you scoff? well yes, it is not as high as I personally would like but I was explained by Guinot's skincare expert Laura Pritchard that a higher percentage of the sunscreen chemicals would destablise the formulation and won't allow the product to penetrate deeper into skin, making it an ineffective anti-ageing product. Besides, no matter what SPF you end up using when outdoors, you should always re-apply every hour to make sure skin stays protected throughout the day. A light and non-greasy cream, this stuffs smells of chocolate cocoa butter and can be quite addictive. Readily absorbed, this keeps skin hydrated all day long and doesn't get greasy on me at all. It also acts as a great primer before makeup applications, a bonus that many will appreciated and enjoy. Although it doesn't leave an obvious white cast in everyday use and has a great finish, be mindful if you're planning to be photographed whilst wearing this as it can have you looking lighter than in real life due to natural sunscreen ingredients (titanium dioxide). 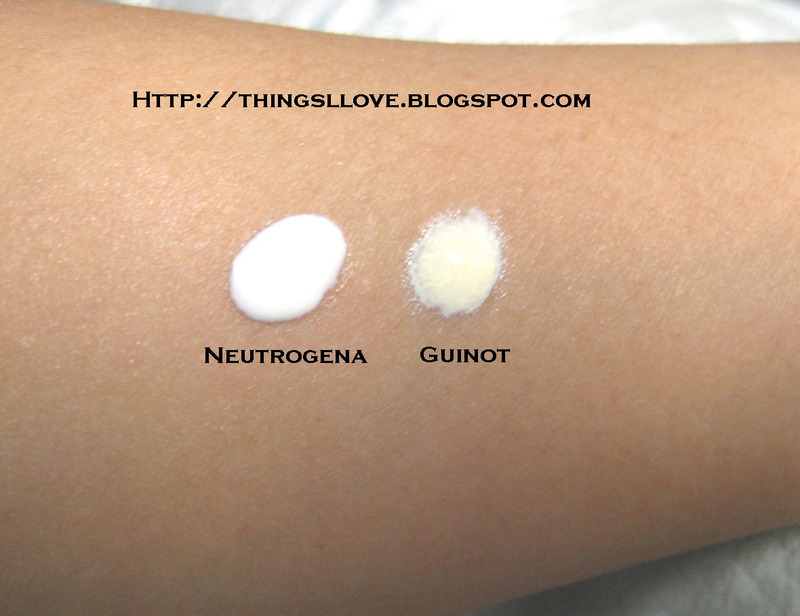 Guinot is available at Guinot salons nationwide. 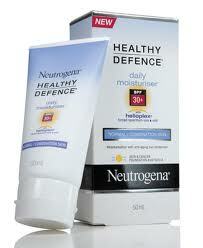 A cheaper and readily available alternative, you will get good hydration and sun protection from Neutrogena Healthy Defence. Also quite light and fluid, it has a subtle fresh scent that disappears within minutes of application. Whilst its texture is not as luxe as Guinot and it does leave a bit of an sheen on skin, it also contains vitamin A, C, E to give instant hydration. It doesn't leave a white cast and dries to a slight sheen finish, but I don't find makeup sitting as well over it and you may need to use a primer to prep your face and I find I can get slightly oily looking during the day with this product, even when using the combination/oily skin formula. In 2 formulations to cater for normal/oily skin and combination/oily skin types, I find this product more suitable for me to use in cooler weather as I don't oil up as much and so I can slap plenty of it on my face and neck. 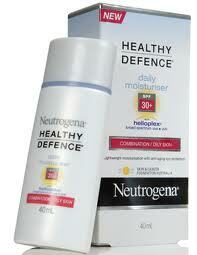 Neutrogena is available in supermarkets, Priceline and pharmacies nationwide. Many people have asked how you can re-apply sunscreen over makeup. Unfortunately, there's no real simple way without without having to do major touch ups on your face. So if you are outdoors, try using mineral foundation for touch up as they contain natural sunscreen that will give you protection or SPF tinted moisturisers instead. samples of these products were sent for review.